The sixth album from the German Metal band from Bochum who've been grinding out the Metal at a rate of knots since forming in 2005 and the release of 2007's debut '...Begins'. Seemingly picking up where 2014's 'F.E.A.R' left off, an album which told the tragic story of a wheelchair bound girl, they've gone for it big style with another grand conceptual piece. Based on a story in which a young honeymooning couple are faced in different ways with the shadowy past of the bride, it sounds more like a plot from a TV drama or the storyboard of a film which might accompany a Meat Loaf song – all surreptitious midnight shadows, atmospheric skyscapes and lace. Strange tattoos, a daughter consumed by fire and mysterious notes all form part of the narrative while musically the album ranges from fiercely intense Rocking to the more epic and Operatic. Fans will naturally delight in taking care to follow the intricacies of the narrative thread through the album although in essence the songs standalone just as effectively. Aside from the occasional growls from the direction of bassist Jens Faber, Jeanette Scherff's distinctive vocals are accompanied on a couple of pieces by Zak Stevens of Savatage and Bjorn Strid of Soilwork. 21Octayne's Marco Wriedt also adds some guitar as special guest, yet it's the vocal intricacies between characters, the title track being a classic example, which add an impressively narrative effect. It's particularly dramatic with the contrast between the soaring clean voice of Scherff and the growls of Faber on 'Light In The Night', a song carried along on a strong melody and typically vast arrangement. Musically, the sound shifts from the fringes of what you might term Symphonic Speed Metal on something like 'Fire' to the more epic and Operatic in the musically theatrical 'From Paradise'. In some cases, the switch from the violent pummelling of drums and overblown crescendos to subtle acoustic moments occurs mid-song. As the story evolves, the music too reflects the mood. 'Scream's grand operatic sound (reflecting a change in the storyline) is accompanied by an intensity in the musical arrangement. 'Hateful Heart' and 'Destroy My World' stand as a couple of big power ballads, the latter introduced with a tasteful Spanish guitar before the strings sweep in and offer some calm amidst the general furore. 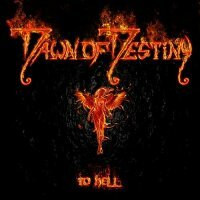 'From Hell' places Dawn Of Destiny firmly alongside the glut of Female-Fronted Symphonic/Power Metal bands and the new material promises to be a baptism of fire for new guitarist in the band (Felix Rodermund).